For manufacturers seeking the raw materials to make their wood products, Probyn Export is the partner that you've been waiting for. 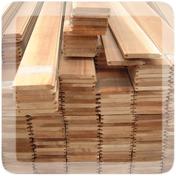 We can ship the lumber you need to produce superior panelling cladding, and wood flitches for sauna panels that will match the expectations of your customers. Contact Probyn Export with a list of your requirements our team will fulfill all of your expectations.